Welcome to an Eviliz chapter on the Ukiah Murders and the Manson Connection. 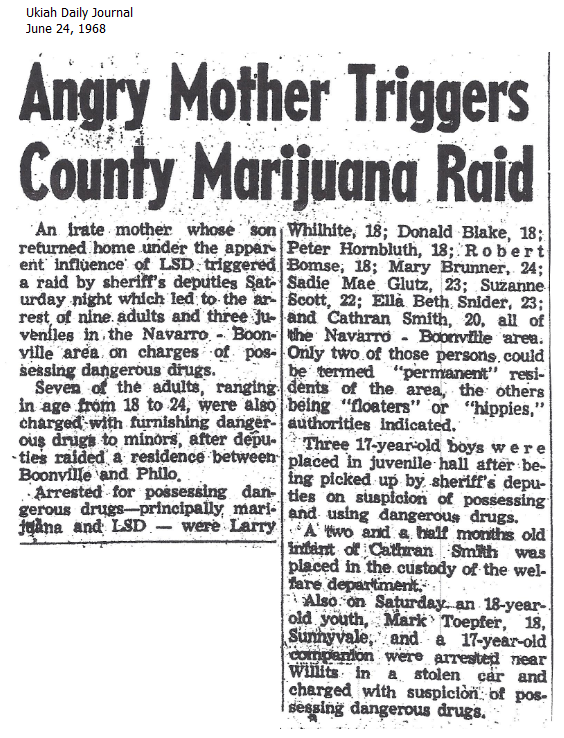 In May of 1968 a chain of events began that rocked Mendocino County, CA. Though unsolved to this day, the triple murder of Nancy Warren and Clyda Dulaney (and her unborn female baby) in October match the gruesome pattern of the Manson Family. 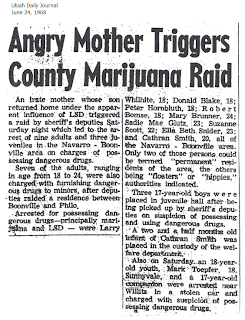 The "Witches of Mendocino" arrests took place as documented in this Article dated June 24, 1968 placing key members of the Family close by. Could they have been involved? The next week or two will shed light. Please join us. As you may remember, Manson sent a group of Family members up to Mendocino County to scout for a new permanent residence. This happened around May of 1968. Sadie, Mary and the gang were zealously trying to gain young recruits. They were dirty - they stunk and the bus stunk - and they were high profile with their drug use, even though they had infants in tow. The locals branded them the "Witches of Mendocino." Boonville and the Anderson Valley has its own language called Boontling. Here's the wiki on it as well as a video. They're not a definitive on the language but they give us a good idea of how it works. The Wiki article has references if any of you care to learn more. We wonder if the Witches may have picked up on Boontling and used a variation they created themselves. ZuZu's for candy comes to mind. The Family was well known to cackle in a language that only those in the know would have any idea what they were talking about. Is this where it began?